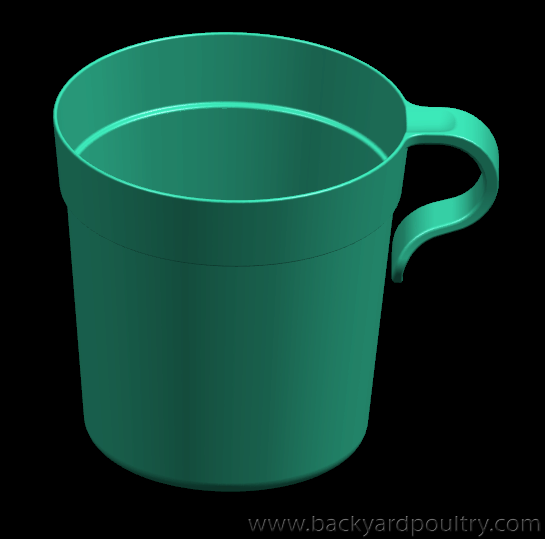 The South Burnett Feather Club started using these cups in their show cages a few years ago. Nearby clubs also adopted the cups. However supplies at the `Dollar Shops' ran out and the cups became unobtainable. Greatlander sponsors the club and I have a permanent display in the Poultry Pavilion at Kingaroy Showgrounds. Greatlander also has a plastic injection machine so naturally I offered to help. We tried making moulds from the existing cups but these were too flexible to mould from. So I drew the cup in CAD and I had a hard pattern CNC-produced. Thanks for that. Our club has been searching for these - will pass it on.